So, we’ve got both candidates hawking the nuclear snake oil. But there is one difference between them. A big big BIG difference. 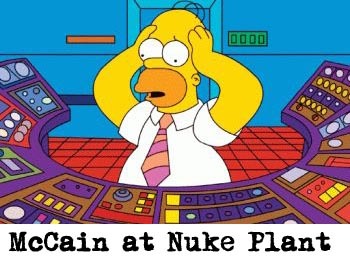 McCain’s ready to spend a hundred billion dollars on nuclear power, no questions asked. But Barack Obama puts a crucial condition on his approval for building new nukes: an affordable method of disposing the new plants’ radioactive waste. That’s not small stuff. While The New York Times reporters following McCain repeated his line about “inexpensive” nuclear power without question, a buried wire story on the same day noted that the Energy Department is putting the unfunded bill for disposing nuclear plant waste at $96.2 billion – nearly a billion dollars per plant operating today. And no one even knows exactly how to do it, or where. Obama has the audacity to ask about the nuclear waste’s cost. “Can we deal with the expense?” he said on Meet the Press. This entry was posted in environment, world. Bookmark the permalink.